Upgrading a coiled tubing unit to e-coil can add valuable versatility to a company’s service offering. 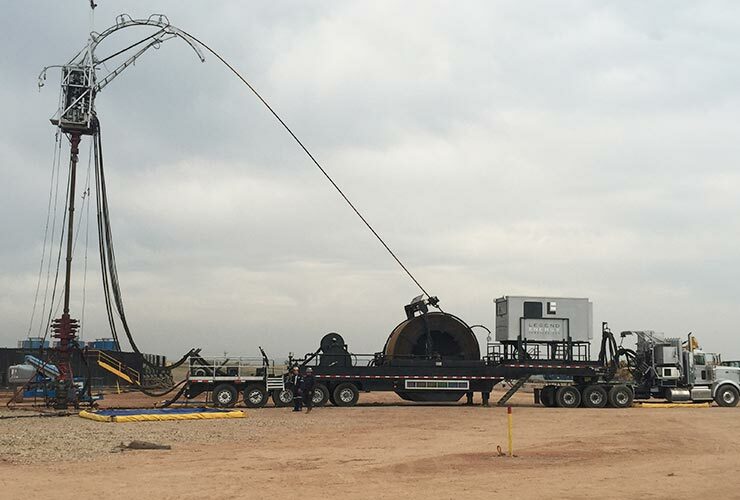 The ability to transmit and receive power and/or communications to and from downhole equipment means that a wide variety of smart tools can be conveyed on the coiled tubing including logging tools, perforating assemblies, cameras and MWD assemblies. Technical upgrade of a CT unit to e-coil is relatively straight forward once you have the right equipment to suit your unit. The e-line itself can be injected by the majority of coiled tubing manufacturers upon completion of the string. A number of other companies also own the devices required to inject e-line, including the e-line manufacturers and some coiled tubing service companies. The other components you will need are an electrical slip-ring to allow the coil drum to rotate while not damaging the conductors, a bulkhead for the back side of the coil which will allow the conductors to pass through while containing the pressure inside the coil, and a suitable surface control system to interface with the downhole equipment. When choosing the correct equipment for your CT unit you should take into account the number of conductors required for your application, the maximum voltage and current to be used, any zoning requirements, the maximum pressure and temperature and the design of the drive mechanism for the coil drum. There are two main designs of slip-ring available to fit onto the reel shaft or adaptor plate, and those are flange-mounted and thru-bore. The simplest design to fit to a unit are the flange-mounted slip-rings but some direct-drive drums make these impossible to use because the drive mechanism makes use of, what would be the free end of the shaft, thus making a thru-bore slip-ring necessary. There are also two main designs of bulkhead. Those which terminate the e-line at the bulkhead and use electrical feedthrus to pass the conductors through the pressure barrier, and those which form a pack-off around the e-line so that it can pass through, all the way to the slip-ring. There are advantages to both, in that the former creates a more reliable pressure barrier using o-rings as the sealing components, as well as allowing for easier maintenance and modification on the wire between the coil exit and the slip-ring. The pack-off type has the advantage of being the simpler design meaning that there are fewer terminations that must be made. Once you have all the necessary hardware to convert your unit to e-coil it is very important that adequate training is given to the field engineers that will be running the service. As with all services, the success of the operation depends upon the quality of the personnel as well as the quality of the equipment being used. A good rope socket and conductor termination at either end of the e-line and the correct slack management procedures are of the highest importance to prevent downtime through e-line failure and to maximise the life of the cable.